Jenga Poetry is an engaging and fun game. 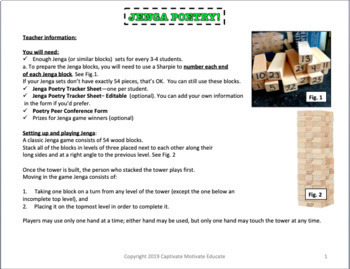 Students use the numbered Jenga blocks and a Jenga Poetry Tracker Sheet to write a poem. Students play Jenga as usual, but as they play, they keep track of the numbered Jenga blocks they remove. 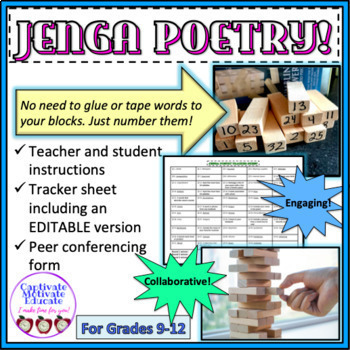 Each numbered Jenga block corresponds to a word, poetry term, or other direction on the Jenga Poetry Tracker Sheet. Once students have checked off at least 10 different (or any number you choose) Jenga blocks, they will be ready to start writing a poem. Great for literacy and learning stations! Perfect for National Poetry Month! **No need to glue or tape anything to your Jenga blocks. Simply number each block. 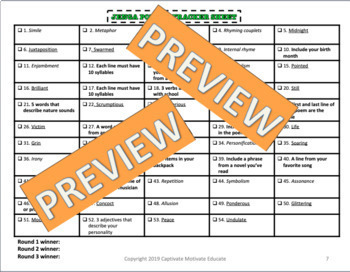 The Jenga Poetry Tracker Sheet has all the information students will need to write their poem. *Note: I did not supply a rubric for this creative activity. This is in accordance with my educational philosophy as listed in my profile. Sometimes it's good to just let the students create and learn just for education's sake. 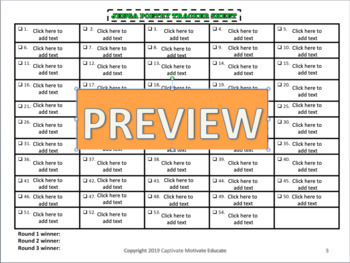 Please consider rating this product to earn TpT credits! Thanks!